RUSH: Here’s Chuck-You Schumer. This is in Washington today on the Senate floor. Audio sound bite No. 24. SCHUMER: Overall, we Democrats are very happy with what we’ve been able to accomplish on a number of very important priorities to the middle class in America: infrastructure, education, opioid treatment, mental health, child care. This spending agreement brings that era of austerity to an unceremonious end and represents one of the most significant investments in the middle class in decades. 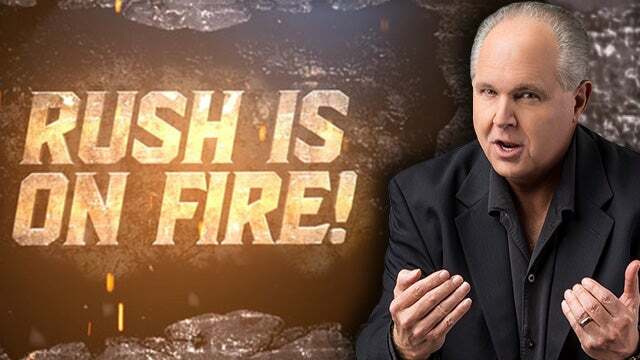 RUSH: I don’t know, folks. I just want to puke when I hear this stuff. I just want to vomit. The era of austerity is over. And now we’re investing in the middle class, from the very party that’s done its best to destroy it and to make them totally dependent on government! I cannot tell you how frustrating it is to listen to this pap! “We’ve accomplished a number of important priorities in the middle class.” You’ve opposed everything that has been proposed to help the middle class, first and foremost the tax cuts. You were lying to the middle class, telling them their taxes were gonna go up! You guys haven’t done anything for the middle class. You haven’t done anything for African-Americans. You haven’t done anything for Hispanics. You haven’t done anything for the groups of people that you represent. They’re angry, they’re enraged, they are poisoned with hatred. From the feminazis to the feminists to the women to the transgenders, to the gays, every aspect of the Democrat coalition is made up of people who are filled with hate and rage and anger from the moment they get up until the time they go to bed, because they’re impossible to make happy! Because they have been robbed of their humanity! They’ve been told they can’t succeed because the obstacles are too great! Too many people are in their way, too many racists, too many sexists, too many bigots, too many homophobes! And so these middle class supporters of the Democrat Party do nothing but sit around and wait for the Democrats to punish all of these mean SOBs standing in everybody’s way! As a result of that, the average Democrat voter never knows the concept of self-achievement. The average Democrat voter never understands even the rudimentary experience of success. Your average Democrat middle class voter has no belief in him- or herself because they’ve all been made victims and they have a built-in excuse for being miserable and failures. And the Democrats are right there to capitalize on it. And what do the Democrats do to help the middle class? Make them more and more dependent, no matter what it is, infrastructure, the government’s gonna fix it for everybody. I truly believe that one of the reasons we have whatever percentage, 40, 45% of this country made up of liberal Democrats, one of the reasons that they are so constantly enraged and why they become little scaredy cat snowflakes on college campus, one of the reasons that they are so angry and filled with hate is that the political party they support has literally robbed them of the experiences gained by success and failure. They have not had the opportunity to experience the feeling of succeeding at something. They have not had the opportunity to learn from failure. All of that’s been removed and instead they vote for people that are gonna take care of ’em cradle to grave, or promise to. As such, they are not self-reliant, they’re not taught to be self-reliant, they’re not taught to be independent thinkers. And so happiness has constantly eluded them. And the Democrats like Chuck Schumer come along and claim they’re doing all this great stuff for the middle class. By what? Putting the country in debt now to the tune of $21 trillion. Infrastructure, education, opioid treatment, mental health, child care. You mean those systems are singing? You mean we’re going great guns? You can’t convince me of it. Infrastructure, education, mental health, child care? These are areas the Democrats want to control. These are areas where our culture is deteriorating rapidly.